Any book that hits the 600-page mark is going to have plenty of moments that drag. FOREVER had those moments, at times feeling as though the book would go on, yes…forever. The premise sounded interesting to me, and as a lover of all things New York I was excited to crack it open and get going. But the main character (Cormac) doesn’t even leave Ireland until the 125-page mark, and the main idea of the story (his immortality) does not happen until page 250, more than 1/3 of the way in. Considering this premise is the book’s main selling point, 250 pages is a bit long, in my opinion, to have to wait. It’s that feeling of knowing what’s going to happen, expecting it to be on the very next page, but then just having to wait for it, reading a lot of filler along the way. If I had a hand in editing, I’d suggest trimming the “Cormac arrives in NY, is granted immortality” section from 120 pages to maybe 60. Cormac is driven for the first half of the book, but then seems to float the rest of the way. Yes, he did this and he did that, living a full life just as he was instructed to live, but it still felt like he was drifting, going through the motions. Many of the great moments in his life happened purely by chance, not by some noble, purposeful intent to experience such great things. The history in the book was engaging, Hamill’s writing had wonderful visuals and there were many superb character moments, but due to the almost episodic nature of Cormac’s years in New York, I would be hard-pressed to give this one more than a 7/10. 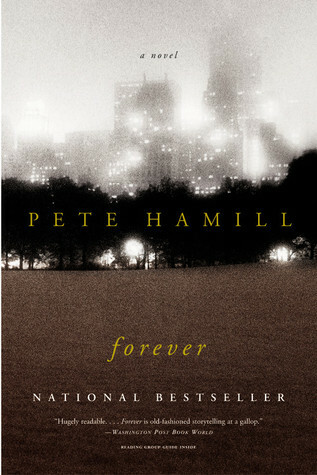 This entry was posted in Book Reviews and tagged Book Reviews, Fiction, Pete Hamill. Bookmark the permalink.